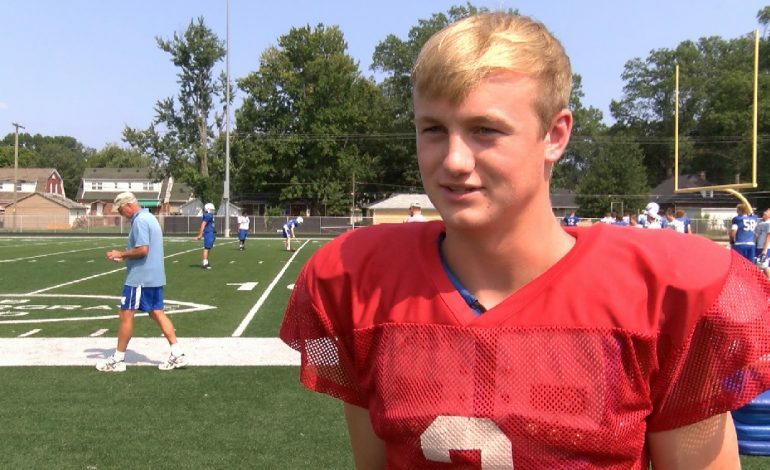 Memorial High School quarterback Michael Lindauer is one of four finalists for Mr. Indiana Football. The senior is the first finalist in Memorial’s modern history. Warren Central receiver David Bell, Pioneer quarterback and linebacker Jack Kiser, and Northwood receiver and safety Bronson Yoder are also finalists for the award. The winner will be announced December 12 by the Indianapolis Star. Lindauer is a four-year starter at quarterback for the Tigers. He passed for 3,858 yards and 51 touchdowns and rushed for 512 yards and 12 touchdowns as a senior. His 10,805 yards and 127 touchdowns rank fourth on the state’s career passing list. Lindauer, a three-sport athlete at Memorial, is committed to play football and baseball at Southern Illinois University. Sources tell Nick Ruffolo he will meet with Indiana University Friday and the University of Cincinnati Sunday and Monday. However, those sources say Lindauer is 100 percent committed to SIU.